Clandestine lab found in Colombia by DEA. The clandestine production of drugs is dependent on the availability of chemicals necessary to produce the illicit drug activity. Most drugs in the illicit traffic, with the exception of marijuana, require chemicals to be produced. The controls placed on chemicals are less than those on controlled drugs because most of the chemicals have other, legitimate industrial uses. These chemicals are regulated under the Control Substance Act as List I and List II chemicals. Examples of these products include over-the-counter medications containing ephedrine and pseudoephedrine, which are found in cold and allergy medicine, but are illicitly used to produce methamphetamine. The DEA Office of Diversion Control (OD) is recognized as the premier international chemical control authority by government's worldwide as well as international organizations, including the United Nations (U.N.). This recognition is the result of the lead efforts undertaken by the U.S. government to regulate chemical commerce due to the important role of chemicals in illicit drug production. The strategy of chemical control offers several advantages over traditional drug law enforcement measures. Rather than pursuing the manpower-intensive exercise of drug interdiction, chemical control offers a means of attacking illicit drug production and disrupting the process before the drugs have been made or entered into the market. Because this strategy in large part is a regulatory exercise, it is implemented at levels where governments have control. The DEA currently monitors forty chemicals which are commonly used in illicit drug production (see attachment). These chemicals are divided into two Lists. Those chemicals which become part of the final psychoactive drug product are referred to as List I chemicals. Those chemicals which merely facilitate the chemical reaction and which do not become part of the final product are referred to as List II chemicals. 2. One that precedes another. Reagent (phonetic) n. A substance used in a chemical reaction to detect, examine, measure, or produce other substances. Solvent (phonetic) n. 1. Chem. A. The component of a solution that is present in excess or that undergoes no change of state. B. A liquid capable of dissolving another substance. CDTA gave DEA the authority to stop imports/exports of any listed chemicals (i.e., ephedrine) if there was reasonable cause to believe they would be diverted into the illicit market. It also required businesses to report suspicious orders to DEA such as cash sales or inordinate amounts of product purchases. The biggest shortcoming of CDTA was that it pertained to illegal meth activities and it only pertained to ephedrine in bulk- which was the preferred form used in the production of methamphetamine at the time. As a result the traffickers turned to ephedrine tablets. DCDCA eliminated the single entity ephedrine loophole, established a recordkeeping threshold and required businesses handling the chemical to become DEA registrants. However, the law did not address pseudoephedrine,or ephedrine in combination with guaifenesin which relieves coughs. Combination ephedrine products were not considered single entity products. As a result, almost overnight, traffickers turned to pseudoephedrine and combination ephedrine products for methamphetamine production. MCA established first-time control of drug products containing ephedrine in combination with another active ingredient usually guaifenesin, as well as pseudoephedrine and phenylpropanolamine (PPA). The act created a new retail category with a 24-gram per sales transaction limit. As a compromise to the industry, any product packaged in blister packs or "safe harbor" packaging was exempt from purchase limits or single transactions at the retail sales level as long as the total package contained 3 grams or less of the base chemical. Shortly after the law passed, traffickers devised "blister zippers" to quickly remove the tablets from the packaging. When it finally became apparent to the industry that this form of product was not unable to be diverted, many chain drug stores and outlets voluntarily imposed sales transaction limits at the cash register. MAPA reduced the threshold for retail sales of drug products containing pseudoephedrine and phenylpropanolamine (PPA) from 24 grams to 9 grams in a single transaction (roughly 3 packages). Each retail package was required to contain no more than 3 grams of pseudoephedrine or PPA per package. The reduced threshold also applied to mail order distributors and those persons/businesses selling over the Internet. The shortcoming is that the 9 gram threshold was that it did not apply to ephedrine products in combination with guaifenesin or products in safe harbor packaging. CMEA lowered the retail sales level to 3.6 grams (base weight) per day per person or 9 grams per month. With this new restriction it was required that the product be placed behind the counter to prevent direct theft or shelf-sweeping. The purchaser of the product is required to sign a logbook and show photo identification at the time of purchase. This process enables individual retail distributors to recognize when the limit of 7.5 grams of product to a person in a 30-day period has been exceeded. Persons engaged in selling at the pharmacy or retail vendor level must be certified with DEA and complete a training session. The retailers are required to certify that their employees are aware of the possible illicit uses of the chemicals; the sales limits; and that they are required to keep record of customer’s names, addresses, product and quantity purchases, and that customers provide proper identification for purchases. The CMEA also calls for quotas on pseudoephedrine, ephedrine and PPA. This is currently being established by DEA. CMEA also requires importers to report to DEA to whom they distribute materials to in 30-day increments until the chemical imported is totally distributed. It should also be noted that these laws primarily pertain to products destined for over-the-counter sales. A bulk seizure of pseudoephedrine found in two vehicles during Operation Northern Star under the cover of legitimate products such as water and bubble gum. When an individual from Colombia walked into the chemical company office in New Jersey requesting to pay cash for nearly two metric tons of ether—an amount equivalent to half of all the legitimate ether imports for the entire country of Colombia for 1980—the chemical company notified the DEA. Seizing this opportunity, the DEA set up a sting operation in Chicago code named Operation Scorpion. A front company was established and contacted the individual with an offer to fill his order. Seventy-six drums of ether were sent to New Orleans. Two of the drums had been wired with electronic tracking devices. After several days, the chemicals were traced to a dense jungle area in Colombia. The raid conducted against the cocaine lab Tranquilandia or "Quiet Village" found a fully equipped cocaine factory. Authorities seized more than 10 tons of cocaine and cocaine base at Tranquilandia and found more labs and similar compounds in the surrounding jungle. The police destroyed drugs and material conservatively estimated to be worth $1.2 billion. Two of the drums in the Tranquilandia raid had been wired with electronic tracking devices such as the one displayed. By satellite, DEA agents were able to monitor the movements of the chemicals. After several days, the chemicals were traced to a dense jungle area in Colombia. 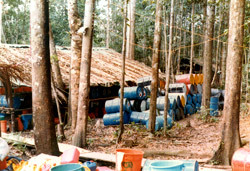 The DEA worked with the Colombian National Police to help raid the site of Tranquilandia. Operation Mountain Express I and II targeted the domestic diversion of pseudoephedrine, primarily by individuals and companies registered by DEA to handle controlled substances and chemicals. With the success of these investigations, methamphetamine producers began to find it increasingly difficult to obtain sufficient quantities of pseudoephedrine domestically. As a result, they turned to Canada where pseudoephedrine was readily available in bulk quantities. In response, Operation Mountain Express III was initiated to address the importation of Canadian pseudoephedrine. Over 30 tons of pseudoephedrine was seized during the three phases of Operation Mountain express. Operation Northern Star continued where Operation Mountain Express III left off. 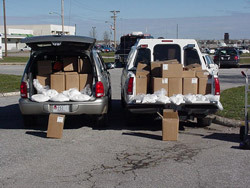 Pseudoephedrine brokers identified in Chicago, Cincinnati, Detroit, and Los Angeles arranged for bulk pseudoephedrine shipments from Canada, most of which entered the U.S. through Detroit and Michigan in tractor-trailer trucks often hidden beneath "cover loads" of legitimate products like bottled water and bubble gum. Over 65 individuals in ten cities throughout the United States and Canada were arrested during Operation Northern Star. Police work done by the Mexican law enforcement in collaboration with DEA concluded in the largest cash seizure in history. Two Hundred and Seven Million Dollars ($207,000,000) was seized from chemical brokers that were supplying chemicals to Mexican cartels to manufacture huge quantities of methamphetamine- most destined for the United States. Seizing this amount of revenue not only operationally and financially disrupt brokers but also cuts off the supply of a vital ingredient needed to make methamphetamine. Meth is one of the biggest problems facing the Chemical Control Program and all levels of law enforcement. Through the diversion of ephedrine and pseudoephedrine, (precursor chemicals used to make meth), the problem has grown to a national epidemic. The number of meth addicts has reached 1.4 million users in the U.S. and millions more around the world. The United Nations calls meth the most abused hard drug on earth. However, as a testament to the effectiveness of the CMEA (and similar predecessor laws as well as laws passed by the states), there has been a 58% decrease in the number of methamphetamine laboratories from 2005 to 2006. The Office of Diversion Control hands out this poster to retailers in order to help make their employees aware of any suspicious purchases or activities common to methamphetamine manufacturing. In order to control the purchasing of products containing pseudoephedrine, consumers are required to take one of these place cards to a pharmacist in exchange for the product indicated. This became a control mechanism based on the requirements of the Combat Methamphetamine Epidemic Act of 2005. Over 2,000 chemical registrants have been denied, surrendered, or withdrawn their applications for registrations as a result of DEA investigations. Between 2001-2004 Diversion Investigators inspected more than half of the 3,000 chemical registrants. Investigators examined the adequacy of security safeguards to prevent the diversion of chemicals to the illicit market and audited their records to ensure compliance with federal regulations.